Can technique be embodied in a tool? 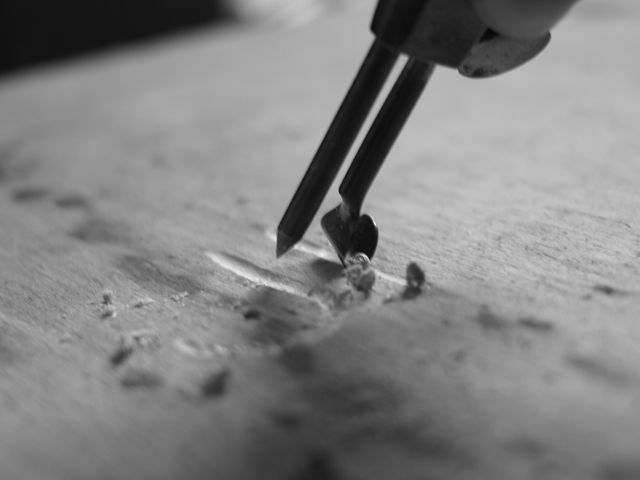 Does the universal nature of hand tools enable a reasonably skilled practitioner to pick up and use an unfamiliar tool? Is experience with tool use, or common sense, enough? Or is it necessary to have external guide: a teacher, book or video? How does the use of obsolete tools become rediscovered, like stone axes? Can they ever be understood and used ‘correctly’ or in a historically accurate manner? 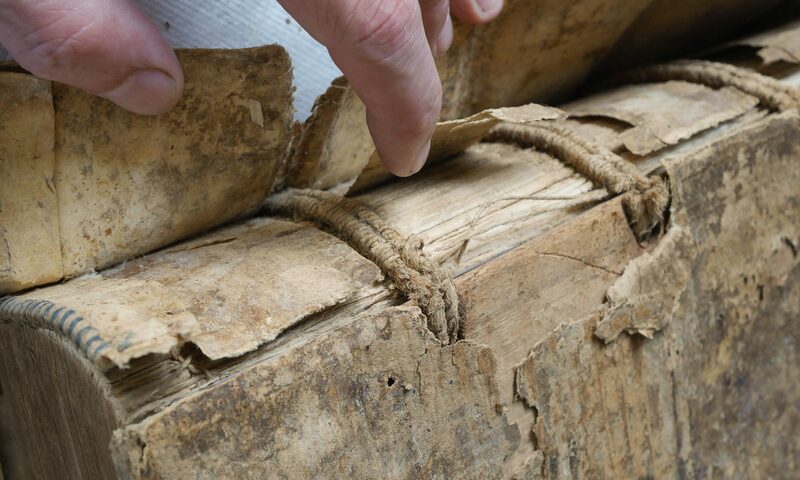 I investigate questions such as these in my research of 18th century French bookbinding, in part by making and using reproduction tools as pictured in Diderot’s Encyclopedié and Dudin’s L’Art du Relieur-doreur de Livres. Since I am familiar with bookbinding tools, it is a matter of subtleties — very important subtleties! — but not massive unknowns. I had a chance to think about these questions a bit more broadly when I purchased the tool pictured below at a flea market. At the time I didn’t know what it was for, but it was cheap and appealingly well made. At first I thought it might be a tool for cutting a groove in leather. The curved tine on the top is sharp (or should be) on both ends and is slightly adjustable in height. This tool is strongly constructed; observe the thick bolster and tapered forged tang. Small details like the wedge shaped, chamfered scales make it comfortable to hold and indicate it was meant to be operated by a pulling motion. The length of the handle is about three inches, or nine centimeters, and I’m slightly embarrassed to use such a cliche, but it really does fit my hand perfectly. It is heavily used but completely functional — often the sign of a quality tool used by a professional. Tools for the amateur market are more likely to be damaged by inexperienced users and poor quality construction. Later, a bit of looking through Salaman’s Dictionary of Woodworking Tools revealed that this is timber scribe or log race, made to carve letters and numbers onto stakes, crates, barrels or other wooden objects. Surveyors used to use it to mark bearing trees. After learning the name of this tool, and by extension its intended use, how to use it seemed obvious. It can be used to carve straight lines just by using the cutting edge, and make curved ones by jabbing the point into the wood. I had no real knowledge of this specific tool and hadn’t seen one being used. Is this a part of what a tool is — an object that contains information about its use? There are nagging questions and doubts that the technique informed from the tool is not as elegant or efficient as possible. Tool use is only a part of the skill sets necessary for a craft. Maybe we do need teachers to demonstrate — or confirm our efforts — that we are using a tool the ‘right’ way. Craft skills are traditionally transmitted by close contact with skilled users, which seems to be one reason for the popularity of short term workshops, even though aspects of this contact can be captured in writing or video. And as the tearout in the image below illustrates, we all need to be occasionally reminded to sharpen our tools. 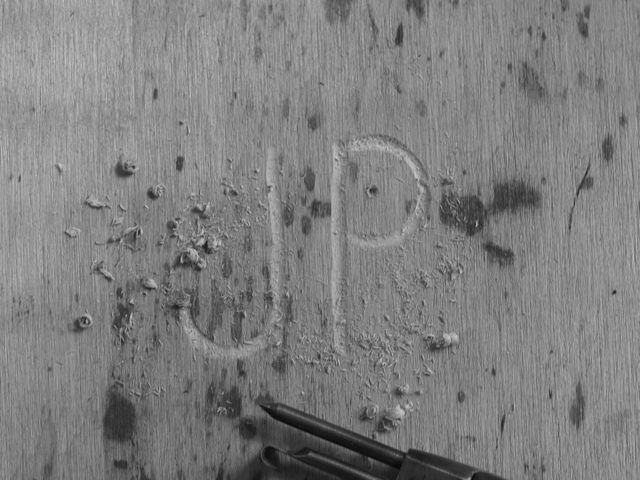 Finally, why the irresistible impulse to carve initials into wood? Old school tagging? Here are images of a timber scribe in use. Very good discussion of the problems of interpreting the use of tools. Wm. Johnson spokeshaves comes to mind. The small rounded boxwood shaves turn up in droves quite often at flea markets. Then the questions turn up on forums as to why there are so many spokeshaves? Looking at a Johnson catalog, they’re listed as Shaves. So Johnson sold primarily to the shoe making factory trade. I’ve assumed the shaves were for last making (also called Spokes), as were Johnson try squares, bevels, gauges, etc. But you wouldn’t know if from just looking at a small delicate shave tagged as a cabinetmakers spokeshave by a dealer. Were you doing your tests on green or dry wood? I’d always imagined a timber scribe being used on rather fresh endgrain. 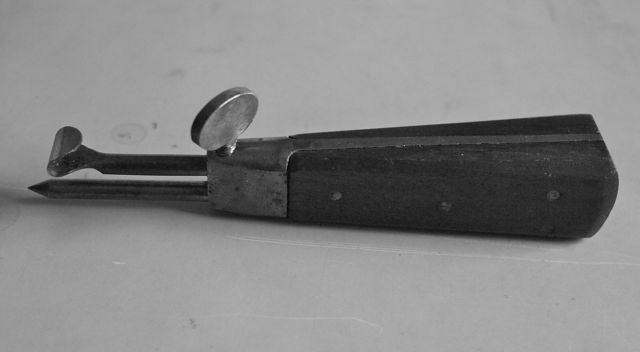 “Leather tool” was a reasonable guess; a timber scribe is similar to the leatherworking tool called a compass race or compass racer, though a compass race has an adjustable gap between the legs. I only tried it out on some pretty nasty plywood, so far. Russell, I was so pleased you followed thru’ with those pieces of quartered timber, They have been in my shed roof for 40yrs, any ‘normal’ person would have cast them into the firewood bin. The pieces when whole would have been approaching 60ft in length, running the whole length of the house supporting from above the spans of the ceiling joists. Principal collar tied trusses at abt 8ft intervals, tennoned purlins crossing one another on a splay, all peg jointed.I will show you my timber race if you show me yours. Cheers, Chris.